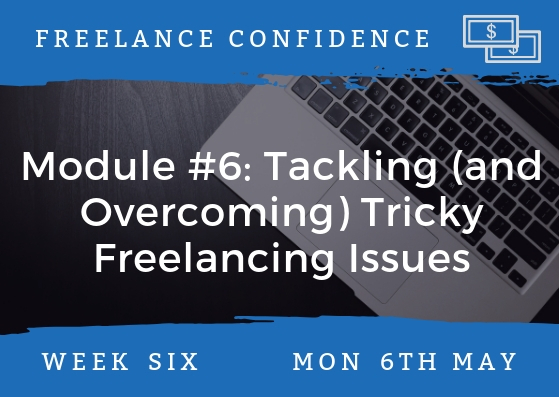 Freelance Confidence is aimed at freelancers who want to get more clients, market themselves more confidently, or take their freelancing further. 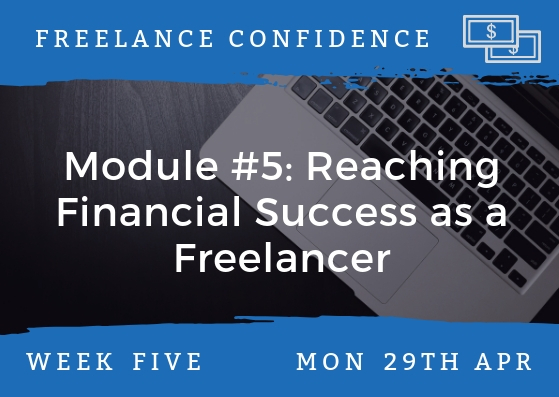 Freelance Confidence is an online course aimed at both new and established freelancers who want to make more money and take their freelancing further. 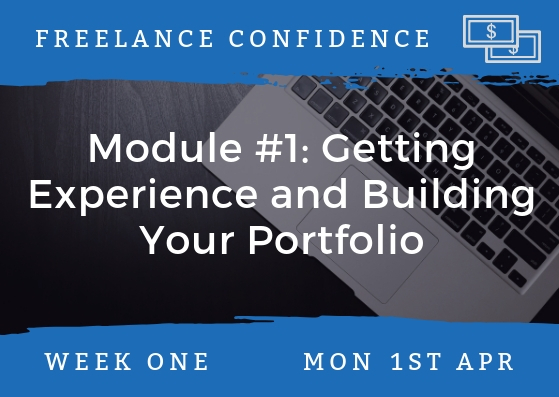 The modules cover, step by step, how to grow your freelancing business, whether you’re just starting out and finding your first clients, or whether you’ve been freelancing for months or even years already. 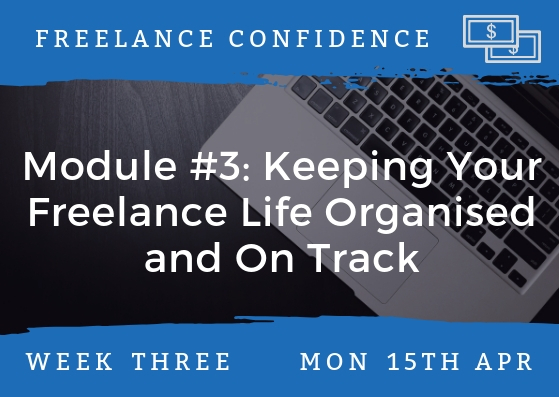 If you’ve taken my Start Freelancing course, you’ll find that Freelance Confidence follows on from that (with a bit of recapping in the first week to make sure everyone’s up to speed). 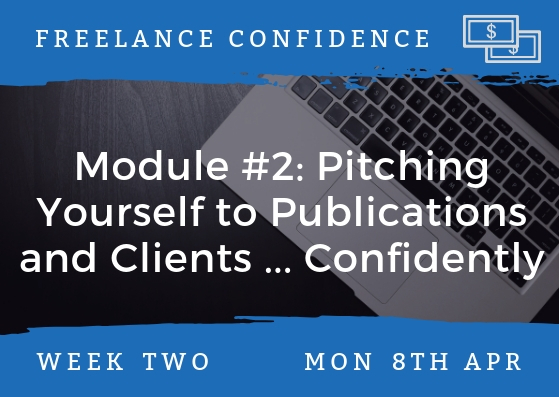 Freelance Confidence costs just $60 for the full six week course, plus four bonus weeks of support after the course ends. You can either pay the full $60 upfront, or you can pay $10/week for six weeks. Note: Registration closes at the end of Friday 29th March, so that everyone can start the course together on Monday 1st April. It has been a rewarding experience for me, though challenging, as it’s all so new to me. The feedback has really helped me personally. As far as course content – it’s brilliant what ever stage people are at and it’s good to be accountable as it keeps us working. 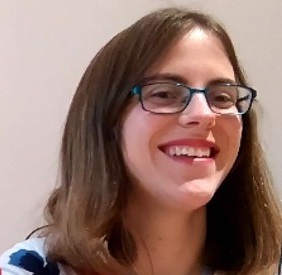 You are always there for support, even by email and you have been a great help to me personally – especially when I was pulling my hair out over WP etc … you Ali Luke are a special person! This was a really valuable (and extremely timely) course for me. 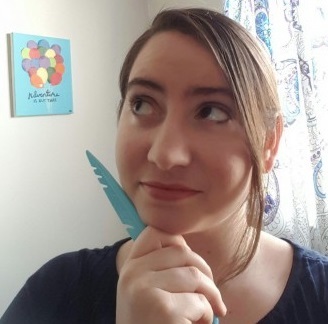 It gave me the push to finish setting up my freelance business, as well as guiding me through the setup in a way that wasn’t overwhelming (I get overwhelmed pretty easily) and provided key info I really needed, especially the tax and payment information. These were my major roadblocks to opening for booking, and as soon as I (finally) set my prices, I’ll be completely ready to open for business. I also appreciated how friendly the group was, how responsive Ali was to messages, and how low pressure this was while still being everything I needed. Occasionally, I’ll include screenshots or images (e.g. when annotating an email pitch to an editor, to show you how it’s put together). Each course has a Facebook group where you can meet other members of the course — and where you can ask any questions you want. 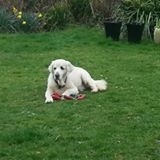 After the course is over, I’ll be around in the Facebook group to support you for the next four weeks. After that, you’re still welcome to use the group to stay in touch with fellow members of the course. Of course, you can leave the group at any time and still have full access to the course itself. 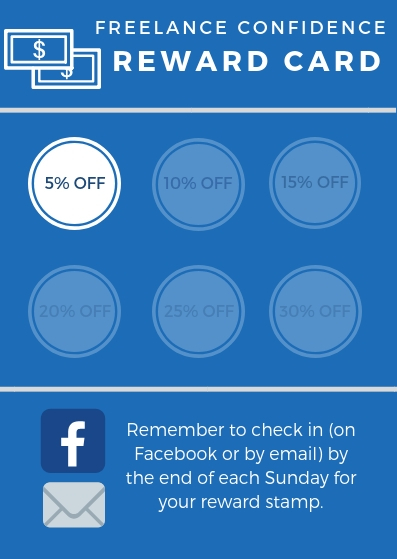 Each week, we have a “check in” topic on Facebook: all members are encouraged to post here once they’ve completed that week’s module. The deadline is the end of the Sunday (e.g. if a module comes out on Monday 8th October, the deadline for checking in is 11:59pm on Sunday 14th October). I’ve been freelancing since the start of 2008. In the eleven years since then, I’ve used freelancing to support myself at different stages of my career and life: I freelanced around a full-time job in the first half of 2008; I freelanced part-time while studying for my MA in Creative & Life Writing from Sept 2008 – Sept 2010; I freelanced full time for a couple of years … and now I fit freelancing around my family (my daughter was born in March 2013 and my son in December 2014). After cutting back on freelancing for a few years, I’ve taken on quite a few new gigs since late 2018, as my son is now in nursery school for most of the week! Whatever your own circumstances, and whatever you want to get out of freelancing, I’d be delighted to be part of your journey. 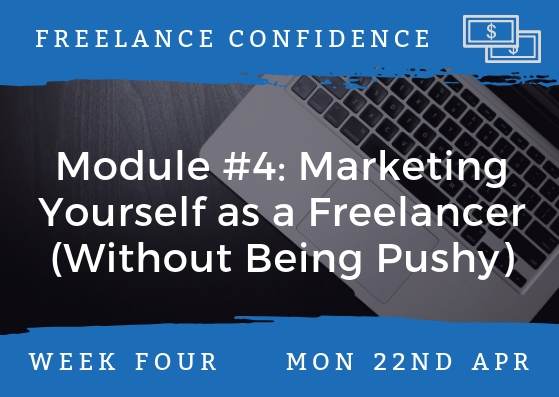 I hope Freelance Confidence will let you go further with your freelancing, whether that means making it a full time career or simply a well-paying side gig. I’ll be here to help you every step of the way. You can either pay the full $60 immediately, or you can pay $10/week for six weeks: it’s up to you. 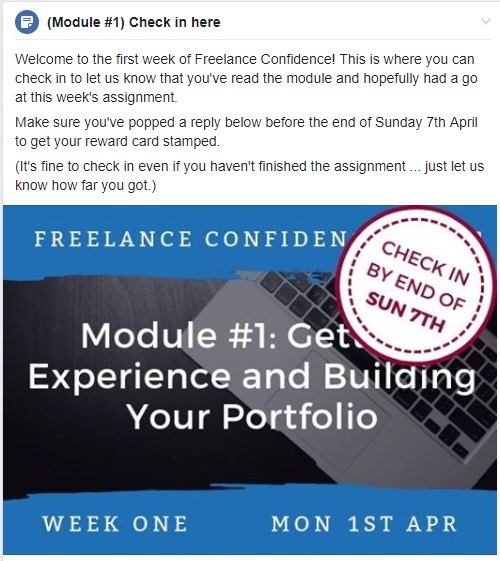 You’ll receive your Welcome pack straight away, so you can join the Freelance Confidence Facebook group and start getting to know fellow members who’ll be taking the course alongside you. Just click the “Join Now” button above and you’ll see the option to pay either as a single instalment of $60, or as weekly instalments of $10 (for six weeks; the four bonus support weeks are free). Whichever option you choose, should see the option to pay with a credit/debit card, which you can use if you don’t have a PayPal account. (I never see your credit/debit card information or any other details; PayPal just sends me the money!) If you’re having problems or need a different way to pay, please drop me an email (ali@aliventures.com) so we can work something out.